In this practical textbook, the author presents innovative and contemporary treatment strategies for the protocols of implant dentistry that span the discipline, from simple single-tooth restoration to complex full-arch rehabilitation of edentulous arches involving sinus elevation and immediate implant placement. Delineated in the book are treatment protocols for clinical situations with different baseline conditions and levels of difficulty, including a section devoted to treating the fully edentulous patients. New technologies, including 3D diagnosis enabled by CBCT, are analyzed for their effectiveness and efficiency. In addition, important complications are discussed within the context of their causes and management; the author does not shy away from presenting examples of implant therapy with unsatisfactory results, valuing the instructive worth of problematic or controversial cases. 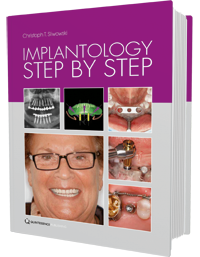 This book provides valuable instruction and guidance to student practitioners on the most up-to-date protocols in implant dentistry. Christoph T. Sliwowski studied Dentistry in Warsaw (graduating in 1982). He has been practicing in Germany since 1987. Since 1989, his main interest has been implantology. In 1995, he took his doctorate in this subject with Prof Hubertus Spiekermann in Aachen; since 1997, his main focus of activity has been in implantology, and since 2003 he has been an Accredited Implantology Specialist with the German Society for Dental Implantology (DGZI) and the European Association of Dental Implantologists (BDIZ EDI). From 1998 to 2008, he was Medical Superintendent at the Zahnklinik Rhein-Ruhr, a specialist clinic for implant dentistry and esthetics in Mülheim on the Ruhr. Since 2010, he has been Director of the Zahnimplantat Klinik Düsseldorf, a dental implant clinic, which he set up at the St Vinzenz Hospital in Düsseldorf.